Eastman Chemical Company EMN has decided to raise prices of acids and alcohols effective Sep 6 or as contracts permit. The move is due to higher market demand and elevated operating costs, especially of raw materials. The company is lifting list and off-list prices of 2-Ethylhexanol(2EH) and 2EH Acid — by 6 cents per lb in North and Latin America. Eastman Chemical is also raising list and off-list prices of Isobutyl Alcohol and N-Butyl Alcohol — by 5 cents per lb in North and Latin America. Eastman Chemical noted, during its second-quarter earnings call, that strong volume gains in the specialty businesses and disciplined cost management have helped it achieve strong earnings growth in the first half of 2018. The company continues to expect adjusted earnings per share year-over-year growth for 2018 of 10-14%. 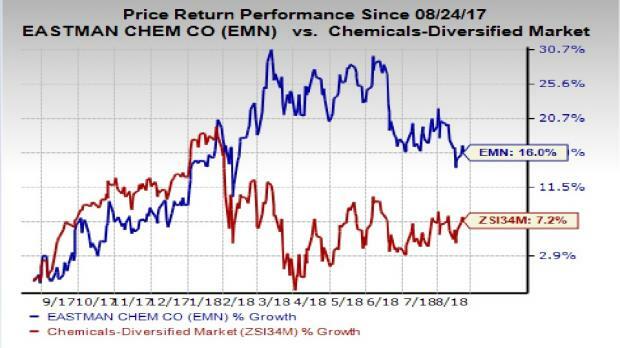 Eastman Chemical has outperformed the industry in a year’s time. While shares of the company have moved up around 16%, the industry saw roughly 7.2% rise. The company is focused on productivity and cost-cutting actions, which are helping it offset raw material cost inflation and other cost headwinds. Eastman Chemical expects to deliver $100 million of cost savings in 2018 under its cost-reduction program. Eastman Chemical is seeing a rise in raw materials costs and the same is expected to persist in the second half of 2018. It is also exposed to volatility in ethylene prices. Nevertheless, the company’s productivity measures and actions to raise selling prices of its products are likely to help it offset the impact of these headwinds. Eastman Chemical is a Zacks Rank #3 (Hold) stock. Some better-ranked companies in the basic materials space are Huntsman Corporation HUN, Air Products and Chemicals, Inc. APD and LyondellBasell Industries N.V. LYB. Huntsman has an expected long-term earnings growth rate of 8.5% and a Zacks Rank #1 (Strong Buy). The company’s shares have rallied 21.8% in the past year. You can see the complete list of today’s Zacks #1 Rank stocks here. Air Products has an expected long-term earnings growth rate of 16.1% and a Zacks Rank #2 (Buy). Its shares have gained 7.7% in a year’s time. LyondellBasell has an expected long-term earnings growth rate of 9.5% and carries a Zacks Rank #2. The stock has rallied 28.2% in a year.